Title: 'Stati Della Corona di Polonia'. 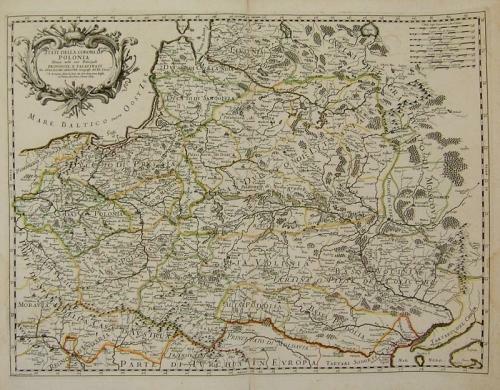 A large and very rare map by Giacomo Rossi covering Poland, Lithuania and the Ukraine. Giacomo de Rossi (1627-1691), his brother Domenico and father Giuseppe had four print shops in Rome where they printed and sold updated maps by other cartographers. In excellent condition (please disregard shadow on the photograph). Wide margins, no foxing, a strong impression. Only very light water stain in the margins and a small centerfold repair.